Nutrients in urine: waste them or use them? At the moment, we are promoting the circular economy in Finland with the five focus areas identified in the Finnish road map to a circular economy, one of which is a sustainable food system. In a sustainable food system, the environmental and climate impacts of food production and consumption are as small as possible. We eat what we need, and the generation of waste is kept to a minimum in the system. Efforts will also be made to make use of the different side streams created by the food system, such as straw, vegetable tops, offal and industrial waste heat. Our goal is to bring sustainable local food into the everyday lives of Finnish people by, for example, accelerating the nutrient cycle, minimising food waste and supporting the use of renewable energy solutions in agriculture. Sitra is building a sustainable food system in collaboration with others. The circular economy helps us examine the food system in a comprehensive manner with the aim of minimising food waste. We co-operate with several operators within the food system. We offer tools that can be used for building a sustainable future and new business. Download the infographic illustrating a sustainable food system here (PDF). 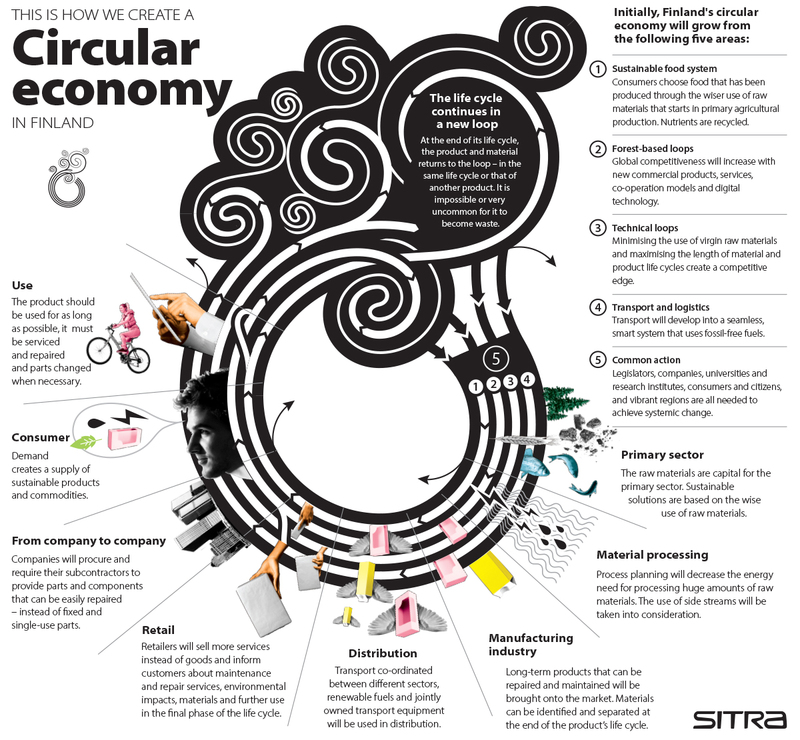 The project descriptions above will give you an idea of what is going on and where, and offer you new ideas, tips and co-operation opportunities for the implementation of the circular economy.